Baptism is the beginning of the journey of faith, and we are delighted that you are considering a baptism service at St John's. Baptisms are also known as Christenings. There is no difference between the two; they are simply different names for exactly the same service. Some key questions are addressed below, but there is also plenty of material about baptisms in general on the Church of England's Christening website. Can I have my child baptised at St John's? Normally, a child should be baptised in their local parish church, or in the church where the family worships. Part of the promises made by the parents and godparents is an agreement to bring the baby up in the church, so it makes sense that this happens locally. Unlike with weddings, this is not a legal requirement, so there is some flexibility. However, if you live outside St John's parish, you will need to inform your local vicar before we can agree to take the service. The role of a godparent is a very important one in a baptism. They are there to help parents bring up a child in the Christian faith, within the fellowship of the Church, and to nurture their godchild spiritually. It is a religious role, not a social one, and it has no legal standing. (If you want a godparent to be a legal guardian, this should be specified in your will.) Godparents must be willing to make promises on behalf of the child about bringing them up in the faith, and it is important to check with potential godparents that they are willing to do this. They need to be old enough to understand and fulfil the commitment they are making, and they must be baptised themselves. There are no exceptions to this rule, but note that baptism in any Christian denomination is fine (so those baptised in the Roman Catholic, Methodist, United Reform, Baptist and Pentecostal churches are exactly the same as those baptised in the Church of England). The normal number is three and the maximum we allow is four, but two is perfectly acceptable. Traditionally, girls had two female godparents and one male, while boys had two male and one female. However, these days there are no rules about this and the gender is not important; what matters is that you choose godparents able to undertake the solemn promises they are asked to make. 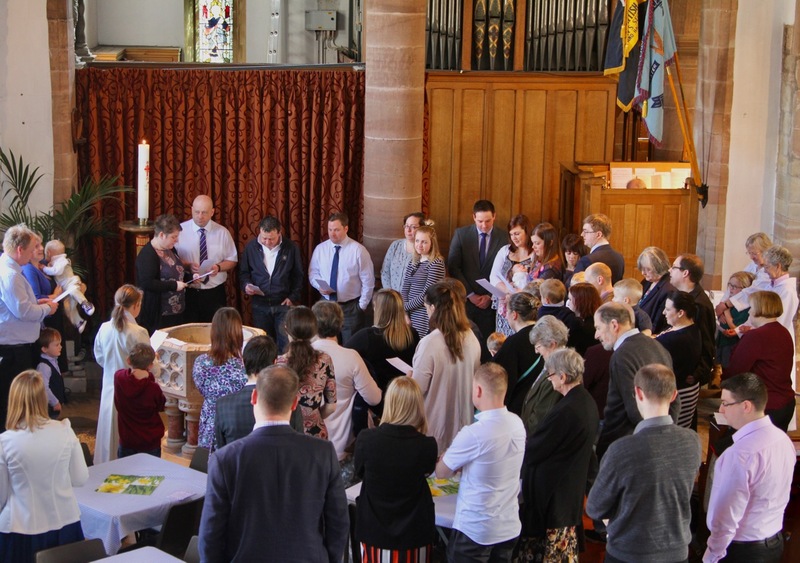 Baptisms normally take place at 12.30pm and 1.30pm on the second Sunday of each month. There are some variations, principally in November when they are usually on the first Sunday. The exact dates will be offered when you arrange the baptism with the office. Please note that exceptions to these dates are not normally allowed. It is also possible to have a child baptised in a main Sunday service, where the dates can be more flexible. Will my child's baptism be a private service? No. Baptisms are public acts of worship and anyone can attend. We do set a maximum of two families per baptism slot, so at most you will be sharing with one other family, but we cannot guarantee a private service. Is there a charge for baptism? No. Baptism is entirely free, although we do put a plate out by the door if anyone would like to make a donation to the church. Can single parents have children baptised? Of course. Sometimes people worry that the Church will not allow them to have baptisms if their partner is no longer part of the child's life, but this is not the case. You are still very welcome to bring your child for baptism. How do I book a baptism at St John's? The easiest way is to come to a special session to book baptisms and weddings, which is held at the Parish Office between 6.30pm and 7.30pm on the first Thursday of each month (this is by appointment only). If this is not convenient, it is best to ring or e-mail the Parish Office to make arrangements. Prior to the baptism, you will be asked to attend a baptism preparation session and a thanksgiving service. Please note that the baptism cannot go ahead until you have been to preparation. Even if you have recently had another child baptised, you will need to attend a new session each time. Anyone can be baptised. However, in the Church of England, adults are also expected to be confirmed when they are baptised. If you wish to discuss this, please contact the Parish Office or one of the clergy.